Monsanto Co's Roundup is shown for sale in Encinitas, California, June 26, 2017. (REUTERS /Mike Blake). 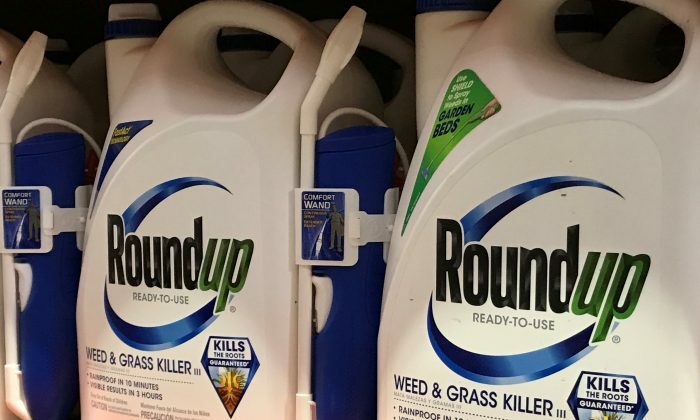 Bayer AG on Feb. 25 faced a second U.S. jury over allegations that its popular glyphosate-based weed killer Roundup causes cancer, six months after the company’s share price was rocked by a $289 million verdict in California state court. The lawsuit by California resident Edwin Hardeman against the company began on the morning of Feb. 25 in federal rather than state court. The trial is also a test case for larger litigation. More than 760 of the 9,300 Roundup cases nationwide are consolidated in the federal court in San Francisco that is hearing Hardeman’s case. Bayer denied all allegations that Roundup or glyphosate cause cancer, specifically non-Hodgkin’s lymphoma. Bayer said decades of independent studies have shown the world’s most widely used weed killer to be safe for human use, and noted that regulators around the world have approved the product. During the first phase in the trial, the nine-person jury was asked to weigh scientific evidence to determine whether Roundup caused Hardeman’s lymphoma. Aimee Wagstaff, a lawyer for Hardeman, told a packed courtroom during her opening statement on Monday that chemicals in Roundup made the weed killer more toxic than glyphosate alone, causing the man’s cancer. But U.S. District Judge Vince Chhabria, who presided over the federal litigation, repeatedly scolded her for “crossing the line” by referring to internal corporate communications the judge has said have no bearing on the science in the case. “You completely disregarded the limitations,” Chhabria said. In a January ruling, Chhabria called evidence by plaintiffs that the company allegedly attempted to influence regulators and manipulate public opinion “a distraction” from the scientific question of whether glyphosate causes cancer. If the jury determines Roundup caused Hardeman’s cancer, the judge said such evidence could be presented in a second trial phase. Evidence of corporate misconduct was seen to play a key role in the finding by a California state court jury in August 2018 that Roundup caused another man’s non-Hodgkin’s lymphoma and that Bayer’s Monsanto unit failed to warn consumers about the weed killer’s cancer risks. That jury’s $289 million damages award was later reduced to $78 million. Brian Stekloff, a lawyer for Bayer, in his opening statement, attacked the idea of a link between Roundup and cancer. He noted U.S. rates of non-Hodgkin’s lymphoma have remained steady over time, even when Roundup use increased in the 1990s.